This is an unique 15 month programme that caught our eye. 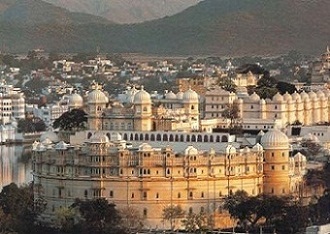 It also has a summer internship as a part of the programme. We tell you a little more about it. Early in January this year, realizing the growing industry needs for skilled Supply Chain professionals, IIM Udaipur in collaboration with Purdue University, US had launched this unique 15-month dual degree program in Global Supply Chain Management (GSCM). The students of this program will be conferred a dual degree – Post Graduate degree in SCM (PGPX) by Indian Institute of Management, Udaipur and an MS degree in GSCM by Krannert School of Management, Purdue University, USA. Students are currently undergoing their US stint of the program. Before moving to US in Aug’13, students did their internship with various industry majors. Given below is some basic information on the internship of these 16 students that comprised the first batch. Some very interesting roles were offered. All roles were in the Operations and Supply Chain domain. Bharti-Walmart recruited exclusively from IIMU for its Supply Chain Planning function. One of India’s leading e-commerce companies, Jabong.com recruited 3 students for its Gurgaon headquarters and offered them strategic roles in core operations with one of them getting a unique opportunity to work in a start-up Jabongworld.com. Hyundai offered a coveted project in the end-to-end network design and optimization. Raymond Limited, one of India’s largest apparel company, hired exclusively for a rare Supply Chain Transformational project. Cummins has offered PPIs to both the hires for their good performance in designing and improving its Indian distribution network. One of the engineering majors, Siemens offered 3 key roles for its Mumbai Corporate office. The FMCG sector was represented by Cargill, which offered internal supply-chain consulting roles for IT implementation. Astra-Zeneca, the pharmaceutical giant, offered a key role in the distribution network design. The manufacturing giant, J.C.Bamford recruited one student for planning & implementing a greener sustainable supply chain. 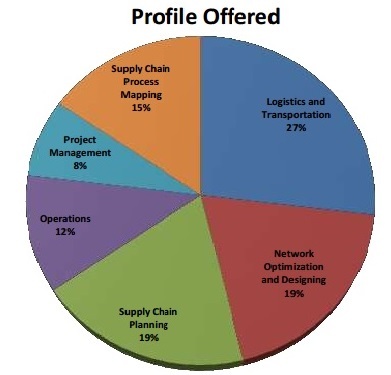 Split of the Profiles offered within supply chain is given below. For a batch of 16 students, the percentage split doesn’t really show any trend but it is good to know what the profiles were. We normally cover only established institutions from which at least 5 batches have graduated but we always keep an eye out for interesting and unique stuff. In any case, Executive programmes even at old IIMs are fairly new. Team InsideIIM believes that this is a promising programme with a good focus. A small batch size is an added advantage. Only time will tell how the programme does as and when it scales up further.